The Designer Op Shop in Braddon buys and sells quality second hand clothing, accessories and homewares. This is the place to look for pieces that have probably only been worn a couple of times and are still in fashion. April’s Caravan offers a huge range of unique pieces from the 50s, 60s and 70s. It’s great for dress up parties or those going for an authentic vintage look – think neon go–go dresses, tailored skirts and quality leather and fur accessories. If you cruise past the music racks in Landspeed Records you’ll find the vintage section at the back of the store. There’re lots of cute leather shoes and bags as well as vintage prom-dresses to browse through, and the pricing is quite reasonable. This Sunday Oct 12 will be the last Retro Depot at the Old Bus Depot Markets for the year. Here you’ll find ceramics, furniture, jewellery, accessories and homewares from the 50s and 60s. 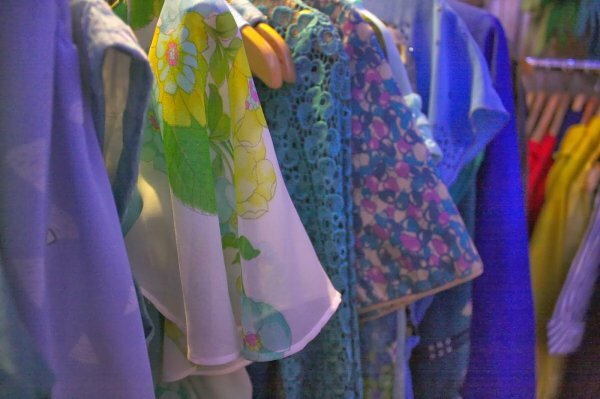 The monthly Fash N Treasure markets host a growing number of professional vintage stalls. There’s also a plenty of hobbyist stallholders who are keen to clean out their closets, and are willing to do so at bargain prices (haggling is acceptable!!). There’s always a number of great vintage stalls along with handmade designer items at the Hustle and Scout Markets. With the new location at the airport, food stalls and entertainment, you can combine your vintage shopping trip with a fun day out with your partner or family. Located on the University of Canberra Campus, The Yellow Canary is marketed towards students, and prices are therefore very reasonable. Most of items are from the 80s and 90s – think lots of denim, Dad jumpers and cute rompers. Located in Fyshwick, Material Pleasures does a roaring trade selling mid to high-end second hand items. I’ve scored a number of great finds here, including Sass and Bide jeans for $10 and Marc Jacobs ballet flats for $50. The stock is displayed according to size which makes it super easy to find the items that will fit you. Have I missed any? Let me know your favourite vintage shopping spots in the comments! Try ‘Out Of The Ark’ selling from Canberra Antiques Centre, 37 Townsville Street, Fyshwick. It’s a well kept secret. Seven days a week too!